John Beilein has been called the “guru” of the X’s and O’s. (I tend to share that opinion.) After 16 years at the helm, he’s arguably one of the best in the business. 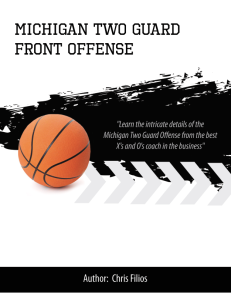 One of the cool things about the Playbook business – plus a little technology – is that we can now get his exact playbook into your hands PRIOR to the game Thursday. Kinda neat… And if you’re anything like me... You like having a little extra insight into how Beilein brings it! It is beautiful in its simplicity. I know you’ll enjoy it.